Light isomerizes 11-cis-retinal, the chromophore of vertebrate visual pigments, to all-trans-retinal, activates rhodopsin, and initiates the phototransduction cascade of reactions that result in the sensation of seeing. Because the turnover of visual pigment during daylight hours exceeds the amount of stored vitamin A in the retina, 11-cis-retinal must be continually regenerated from all-trans-retinal. Photoisomerization of 11-cis- to all-trans-retinal occurs in rod and cone photoreceptors, whereas enzymatic isomerization of all-trans- to 11-cis-retinol occurs in adjacent retinal pigment epithelial (RPE) cells. The reactions in the two cellular compartments are coupled into a visual cycle by the directed flow of retinoids across the intercellular matrix separating these two cells. Considerable progress has been made in recent years in understanding the visual cycle and its relationship to phototransduction. However, molecular details of the visual cycle remain, for the most part, very poorly characterized. In particular, the isomerase remains elusive and the intercellular diffusion processes are very poorly understood. Retinal pigment epithelium (RPE) layer of the eye. Work in my group is directed towards obtaining a molecular understanding of visual cycle reactions and retinoid transport processes. We employ several approaches to the problem. HPLC analysis of visual cycle intermediates has been useful in identifying the slow steps in the vertebrate rod visual cycle and in understanding the flux of retinoids through the visual cycle after a flash or during constant illumination. The information obtained from these studies allows us to concentrate our efforts on understanding the nature of the enzymes catalyzing slow steps where control may be exerted. Characterization of the phenotypes of mice with targeted disruptions of genes coding putative visual cycle components has also resulted in considerable insight into molecular aspects of the visual cycle. For example, deletion of the gene for cellular retinaldehyde-binding protein (CRALBP) produced mice with a substantial delay in visual pigment regeneration because of an impaired isomerase reaction, suggesting that the binding protein is a functional component of this reaction. 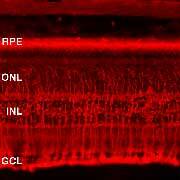 Deletion of the gene for interphotoreceptor retinoid-binding protein (IRBP), a protein suggested to function in the intercellular diffusion of retinoids, resulted in mice with normal visual cycle kinetics, suggesting that the role of this protein in visual physiology needs to be re-evaluated. Deletion of the gene for cellular retinol-binding protein type I (CRBPI), thought to deliver vitamin A to an esterification enzyme, resulted in delayed transport of vitamin A between photoreceptors and RPE, providing insight into the mechanism of intercellular diffusion of the vitamin. Thus, early in vitro experiments led to hypotheses for biological functions, which were tested by targeted deletion of specific genes in mice. The results from these in vivo approaches leads us back to in vitro experiments with which we will define more precisely the molecular functions of various components of the visual cycle. The information obtained from our studies will dovetail with medical genetic findings outlining the molecular basis for inherited defects in individuals suffering from inherited night blindnesses. Ahmadi AJ, Saari JC, Mozaffarian D, Garwin GG, Tarbet KJ, Orcutt JC, Hargiss JL & Sires BS (2005). Decreased carotenoid content in preaponeurotic orbital fat of patients with involutional ptosis. Ophthal Plast Reconstr Surg 21, 46-51. Saari JC & Crabb JW (2005). Focus on molecules: cellular retinaldehyde-binding protein (CRALBP). Exp Eye Res 81, 245-246. Salvador-Silva M, Ghosh S, Bertazolli-Filho R, Boatright JH, Nickerson JM, Garwin GG, Saari JC & Coca-Prados M (2005). Retinoid processing proteins in the ocular ciliary epithelium. Mol Vis 11, 356-365. Bonilha VL, Bhattacharya SK, West KA, Crabb JS, Sun J, Rayborn ME, Nawrot M, Saari JC & Crabb JW (2004). Support for a proposed retinoid-processing protein complex in apical retinal pigment epithelium. Exp Eye Res 79, 419-422. Saari JC, Nawrot M, Garwin GG, Kennedy MJ, Hurley JB, Ghyselinck NB & Chambon P (2002). Analysis of the visual cycle in cellular retinol-binding protein type I (CRBPI) knockout mice. Invest Ophthalmol Vis Sci 43, 1730-1735. Kennedy MJ, Lee KA, Niemi GA, Craven KB, Garwin GG, Saari JC & Hurley JB (2001). Multiple phosphorylation of rhodopsin and the in vivo chemistry underlying rod photoreceptor dark adaptation. Neuron 31, 87-101. Saari JC (2001). The sights along route 65. Nat Genet 29, 8-9. Saari JC, Nawrot M, Kennedy BN, Garwin GG, Hurley JB, Huang J, Possin DE & Crabb JW (2001). Visual cycle impairment in cellular retinaldehyde binding protein (CRALBP) knockout mice results in delayed dark adaptation. Neuron 29, 739-748. Sires BS, Saari JC, Garwin GG, Hurst JS & van Kuijk FJ (2001). The color difference in orbital fat. Arch Ophthalmol 119, 868-871. Garwin GG & Saari JC (2000). High-performance liquid chromatography analysis of visual cycle retinoids. Methods Enzymol 316, 313-324. Saari JC (2000). Biochemistry of visual pigment regeneration: the Friedenwald lecture. Invest Ophthalmol Vis Sci 41, 337-348. Saari JC, Garwin GG, Haeseleer F, Jang GF & Palczewski K (2000). Phase partition and high-performance liquid chromatography assays of retinoid dehydrogenases. Methods Enzymol 316, 359-371. Taylor MR, Van Epps HA, Kennedy MJ, Saari JC, Hurley JB & Brockerhoff SE (2000). Biochemical analysis of phototransduction and visual cycle in zebrafish larvae. Methods Enzymol 316, 536-557. Van Hooser JP, Garwin GG & Saari JC (2000). Analysis of visual cycle in normal and transgenic mice. Methods Enzymol 316, 565-575.